If there's one we thing we got this week it was new gadgets. Well, confirmations of wearables that we already knew were coming and most of the specs and features. Which is good enough for us. Here's the biggest wearable tech news from the week just gone as well as our Crowdfund this pick. The second gen Gear Fit tracker comes with GPS and a standalone music player. Get the lowdown on Gear Fit2 specs, price and release date in our comprehensive Fit2 guide. Elsewhere, take a look at our popular best fitness tracker list as well as our running hub for news, reviews and how to guides. Samsung's sporty hearable will be available later this year, compatible with Android phones only, not iOS. Look forward to voice feedback and sports app syncing on the Gear IconX. 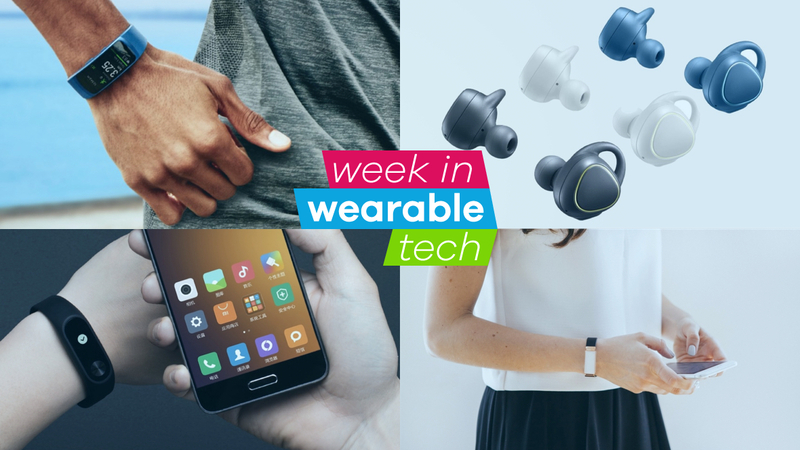 This week we gave our best hearables roundup (to buy now, coming soon and rumoured) a big refresh so check that out. Plus this week we reviewed the Bragi Dash - how do those earbuds perform? But still damn cheap. The fitness band, which has an OLED display, is now official, going on sale on 7 June. Xiaomi's promising more accurate activity tracking on the Mi Band 2 - look out for a review coming soon. The news out of China at the moment is that smartwatches, as well as trackers, are set to do well in sales. And we saw the launch of the Ticwatch 2 from the Chinese AI, voice and smartwatch startup Mobvoi - international edition coming this summer. Something a bit different from a focus on physical health, Zenta is the second product from London startup Vinaya. With HRV, temperature and galvanic skin response sensors and AI algorithms, the biometric bracelet (and app) is aiming to become your digital therapist and help you deal with stress, anxiety and your emotions. Plus it's doing rather well over on Indiegogo where it launched this week. We spoke to Vinaya's CEO Kate Unsworth on using emotional AI to help people deal with everyday emotions. And for this week's #Trending, we looked at a couple of other tech companies using galvanic skin response sensors. Our crowdfund this pick of the week is the Mover Kit by Technology Will Save Us. This fun wearable device gets kids coding and moving by allowing them to program it to light up different colours depending on whether they're running, shaking or jumping. Awesome. Find out how the Mover Kit came to life in our interview with TWSU CEO Bethany Koby.